Add Eve Jewelers to your favorite stores and receive newsletters about new items & special promotions! 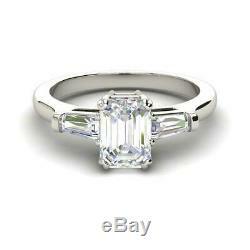 Baguette Accents 1.75 Ct SI1/D Emerald Cut Diamond Engagement Ring White Gold. 100% Natural Earth Mined Certified Diamond. This stunning, Baguette Accents 1.75 Ct SI1/D Emerald Cut Diamond Engagement Ring White Gold 1.75 carat Emerald cut natural diamond engagement 14k white gold ring features a 1.25 carat Emerald cut center stone with an SI1 clarity, D color with accented stones totaling approx. 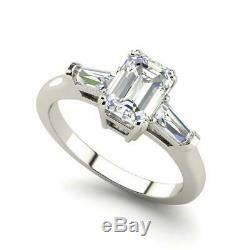 0.5 tcw, SI1 clarity, D Color giving this amazing ring a total of 1.75 tcw. We also accept all major credit cards. 60 days counting is calculated upon item receipt. All our diamonds are certified by a 3rd party gemological services. We usually use GIS which is well known for grading clarity enhanced diamonds. The certificate has a serial number that can be shown online. We are one the biggest suppliers to stores in diamonds industry in all center cities, such as HK, London, Antwerp, New York and Milan; a reliable jewelry and diamonds manufacturing store boutique. 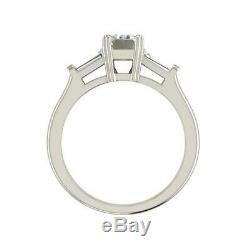 We specialize on clarity enhanced diamonds. Clarity enhanced diamonds are 100% natural earth-mined diamonds, which went through a special procedure in order to make them more sparkling and more shiny. We use only 14kt or 18kt anti allergic gold, means you are getting the finest materials, with no risks. Established in 1962, we're specializing in all types of new diamond jewelry. Whether youre looking for 50 carat diamond, a set of earrings, or the perfect engagement ring, we have a broad selection of options as well as a network of connections in the industry to provide you with exactly what your heart desires at a fair price.